Mallikarjuna Kharge said his party would not function as an "opposition for opposition sake". Congress vice president Rahul Gandhi with party president Sonia Gandhi in Delhi. With Congress vice-president Rahul Gandhi reluctant to take on the responsibility of leading his party in the Lok Sabha, party chief Sonia Gandhi on Monday nominated Mallikarjun Kharge as the leader of the party in the lower house. However, it is still unclear whether the Congress, with its all-time low tally of 44, will get the Leader of the Opposition status. While Sonia was reportedly not keen to take up the post, apparently because of health reasons, several Congress leaders, including Digvijaya Singh and Shashi Tharoor, had said that Rahul should lead the party in the Lok Sabha. 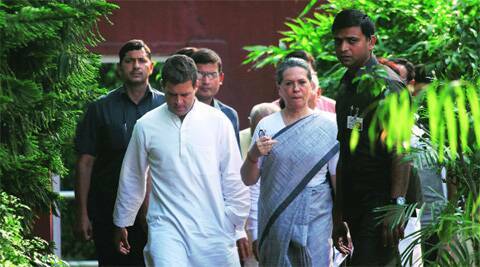 Although party leaders welcomed Sonia’s decision on Monday, they privately said it was time for Rahul to shed his reluctance. “Individuals may have their views, but as loyal Congressmen and women, we will all rally around the party leader and give him our unstinting support,” Tharoor told The Indian Express. He had earlier argued that the Congress should “end this experiment with diarchy” where the leader of the party is different from the leader of the party’s governmental or parliamentary wing. He had said the party’s leader in the LS should be either Sonia or Rahul. Even the Indian Youth Congress, which had passed a resolution asking Rahul to lead the party in the LS, changed its tune on Monday. “Whatever Soniaji has decided, that is fine,” said IYC president and newly-elected Lok Sabha MP Rajeev Satav. Sources said the uncertainty over whether the Congress would get the Leader of the Opposition status was just one factor that weighed on the leadership’s mind. A more important factor was Rahul’s reluctance to take up the post — a full time job that would require him to devote more time and energy in Parliament. Sources in the Rahul camp said his focus now was on rebuilding the party and regaining lost ground. “It will once again send a wrong signal that he is a non-serious politician,” said a party leader on condition of anonymity. In the last Lok Sabha, Rahul was among the worst performers — both in terms of attendance and participation. Data from PRS Legislative Research showed Rahul had an attendance of just 42 per cent till mid-February, much below the national average of 76 per cent. In fact, he was among the bottom 30 MPs across all parties when it came to attendance. He participated in just two debates during the entire term, asked no questions and brought in no private member Bills. Rahul’s interventions in this Lok Sabha include one on the Lokpal Bill. Kharge, 71, the party’s veteran Congress leader from Karnataka and its Dalit face in the state, is a second-term MP. He is also a nine-time MLA, having never lost an election, and was the Leader of the Opposition in Karnataka. In UPA II, he was first made the Labour Minister and then given the key Railways portfolio. With the Congress winning nine seats from the state, “it is only fair that we reward Karnataka,” said a senior party general secretary. It is now for the new Speaker to recognise the Congress as the main opposition group so that its leader can get the status of Leader of the Opposition.